The 2008 User Study collected data using a mailed, self-administered questionnaire (SAQ), which was sent to members of state, local, and tribal health organizations/agencies. 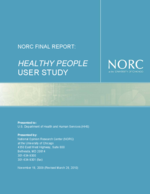 The survey was developed by reviewing the questionnaire and findings of the 2005 User Assessment, gathering information on HHS-sponsored activities that have taken place over the past two years, and reviewing planning activities that are currently underway to prepare the next decade’s set of national objectives for health promotion and disease prevention. The sample for the 2008 User Study was constructed from multiple sources, with separate sampling frames for state, local, and tribal health organizations/agencies. Included were two groups within each State’s Department of Health; the Healthy People State Coordinator (HP Coordinator) and the Chronic Disease Director, as well as a sample of local health organizations. The study also sought responses from two different types of tribal health organizations: individual tribal health organizations and Multi-Tribal Area Health Boards (MTAHB). The project surveyed all HP Coordinators, Chronic Disease Directors, and MTAHB, and, it sampled local and tribal health organizations. The study’s sample sizes and response rates are shown in the table below. Survey results were then summarized within and across organization/agency type. To supplement the information gathered through the survey responses, 10 informal discussions with users and non-users of Healthy People 2010 were conducted. These discussions provided an opportunity for key stakeholders to describe in greater detail their utilization of Healthy People, and how the initiative could be improved.